A simple and classic trout recipe bursting with flavor makes any night of the week a special occasion. 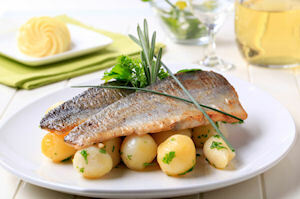 Lightly breaded trout is topped with a creamy brown butter sauce and garnished with zesty lemon to highlight the tender and delicate flavor of fresh caught trout. Season trout with salt and pepper to taste and dredge in flour. Heat 2 Tbsp butter in large skillet over high heat until melted. Add trout, and brown both sides. Lower heat and cook 5 minutes on each side, or until cooked through. Set aside. Add 2 Tbsp butter and cook, over medium heat, until butter begins to brown. Add almonds, and toast until just browned. Add butter and almonds over warm trout, and sprinkle with lemon juice and parsley. Garnish with fresh lemon slices.